Movie Beards: Biker: "Brain Damage"
The silhouette of a beard emerges from the hallway of the Sunshine Hotel. The bearded biker spends 30 seconds of his screen time professing his desire to drink beer and watch the world explode. His face has so much beard that he had to get the rest of it tattooed on his arm. He uses that bearded arm to punch a door open, vanishing from our lives forever. Little did this biker know, a man named Brian was just around the corner desperately trying to commit random murder to please a soulful, smooth-talking, brain-eating slug named Aylmer. Brian and Aylmer possess a symbiotic relationship in which Aylmer injects Brian's brain with a blue hallucinogenic liquid as long as Brian provides a steady supply of human brains. Brian attains a euphoric life without pain, hurt or suffering by unknowingly killing people while high as a Spiderman kite. At rock bottom, Brian starts trolling the hallways of the Sunshine Hotel, knocking on doors and looking for victims. 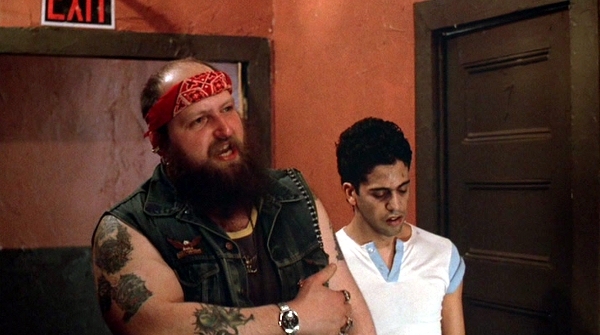 And a drunk, bearded biker with a beard tattoo stopped Brian from killing strangers simply by appearing on screen. The mere presence of a beard can prevent slugs from slurping your brains out of your face. Witness the power of the beard in Frank Henenlotter's cult classic "Brain Damage."